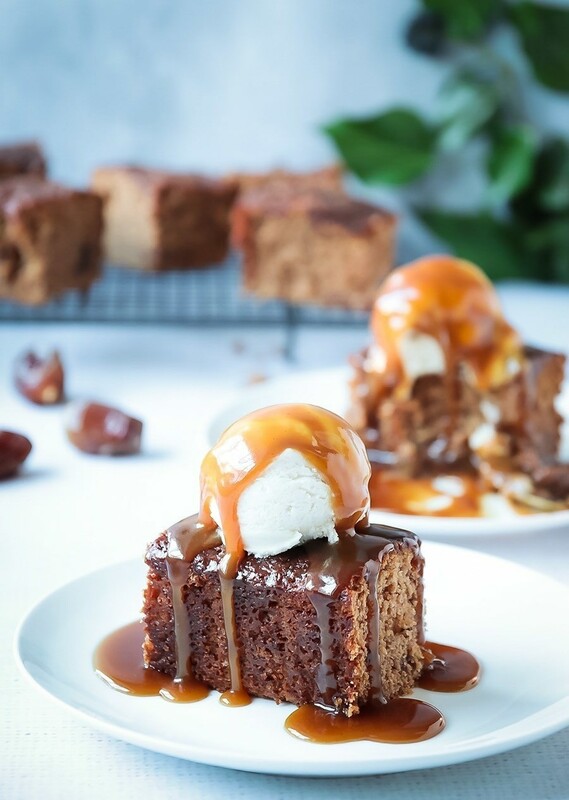 This is a real treat, it makes for the most deliciously indulgent dessert for a special occasion. its dairy free, vegan of course, contains dates and spices but it also contains sugar, but everything in moderation right? what it lacks in health benefits it makes up for in Happiness. 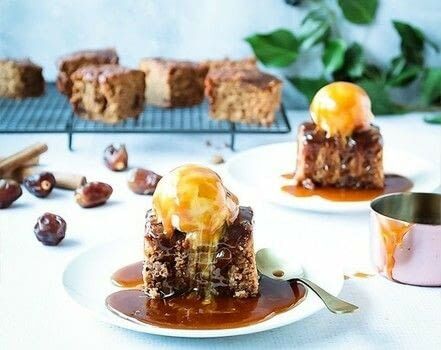 This recipe makes quite a lot of toffee sauce, it can be jarred and stored in the fridge for a couple of weeks, if you don’t use it all. Line a 30×20 cake tin or equivalent size. Combine the almond milk, ACV and vanilla in a bowl and leave to curdle. In large bowl combine the flour, bicarb, baking powder, sugar and ground spices. Drain the dates after they have had about 20minutes to soak and blitz them with a hand blender or food processor, they don’t need to be pureed. Melt the coconut oil and syrup of choice gently, add in the diced stem ginger. Combine the almond milk mix, coconut oil mix and mushy dates together, and gradually add this to the dry. Stir gentle to combine, but do not over work the mix. Pour into the prepared tin and place in a pre-heated oven for 30mins or until risen, lightly golden on top and a skewer come out clean. Remove from the oven and allow to cool in the tin, it will sink a little in the middle, this is fine. 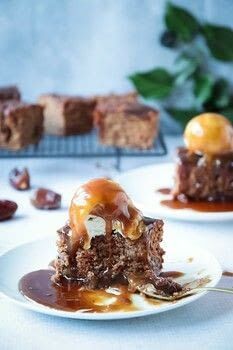 In a sauce pan add the butter, sugar, golden syrup and vanilla, whisking to melt over a medium heat until combined and bubbling. Simmer for a few minutes before adding in the oat cream gradually, whisking the whole time. Allow to simmer for a further couple of minutes. Prick the cake ever couple every inch or so with a skewer and pour over a ½ of the sauce. Reserve the rest for serving. When you are ready to serve. 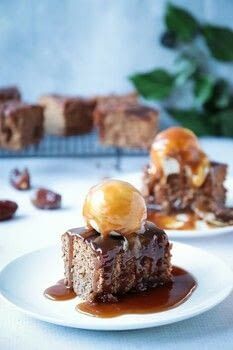 Cut the cake into squares and place it on a serving dish with a ball of ice-cream on top, finish with a good drizzle of extra toffee sauce.